Tragic legacy: Why can’t captive animals be released back into the wild? Mutilation, disease, mental trauma and a reliance on their human captors leaves most captive animals without the ability to survive in the wild. One of the most heartbreaking things about working in this field is knowing that most captive animals rescued from a lifetime of torture, are almost certainly unable to return to their natural habitat. Captivity robs animals of many things - their dignity, their physical health, their mental wellbeing. It also often strips them of essential survival skills. 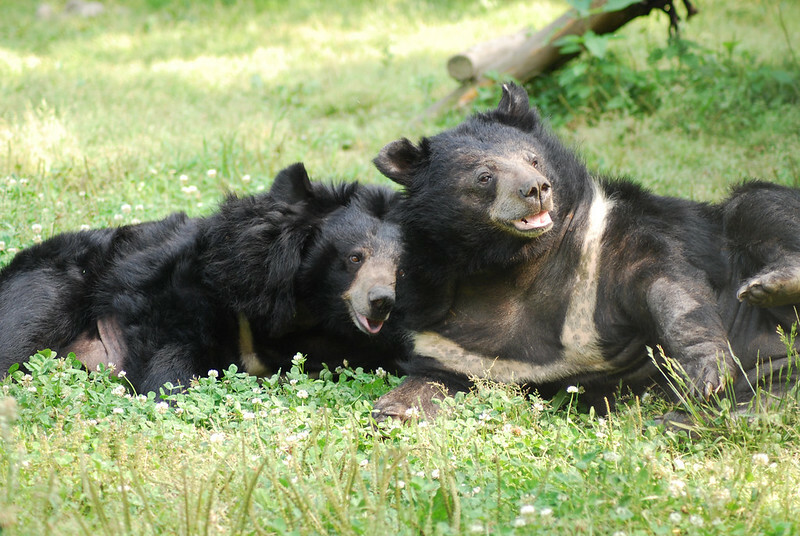 Most of the bears Animals Asia has rescued from horrific bile farms over the past two decades, are moon bears whose vast habitat ranges from Iran to Japan. In the wild, these bears roam a territory of several square kilometres. They spend most of their days sleeping in dens and nests up trees that are built from twigs, branches and leaves gleaned from the forests around them. Their diet includes fruits, nuts, acorns and leaves which they forage for at dawn or dusk when they are most active. They love to climb trees, especially to escape the rain-sodden ground or a lurking predator. They are deeply attuned to their surroundings and their world is rich with smells (the damp, peaty smells of the forest), sounds (of birds and insects) and colours (of the sky, trees and rivers). Contrast this with the experience of a bear in captivity, especially one who has been poached from the wild, torn from their family and chained in a cage for years on end so their bile can be extracted. These bears spend most of their days confined to a space so small, metal bars dig into their bodies. They can’t stretch their limbs. Some are missing paws, lost to a poacher’s snare or hacked off to be sold. They cannot forage when hungry or sniff out a stream for water when thirsty. Their world is one of hunger, disease, pain, fear and apathy - a life completely devoid of any positive stimulus. When they are eventually rescued, they are so mentally traumatised and their sense of spatial awareness so impaired they must be coaxed into stepping into the world outside. 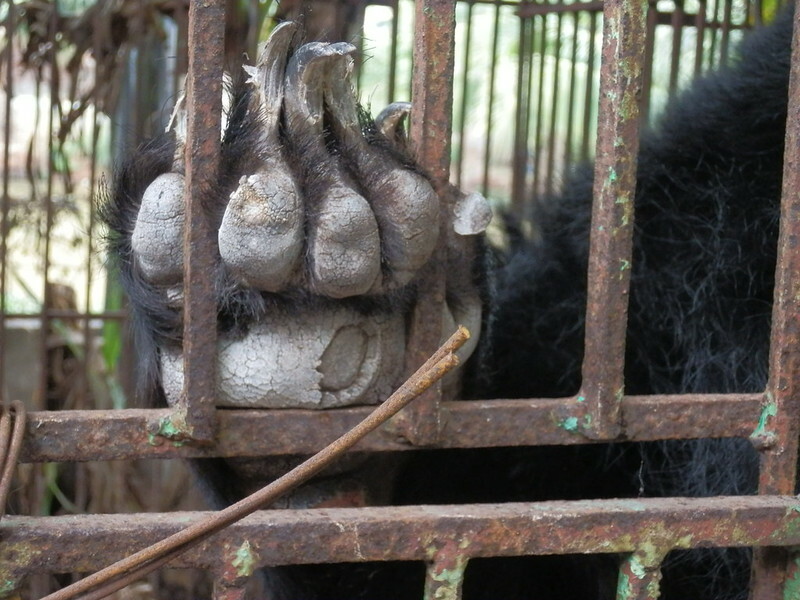 In Vietnam and China there is a further problem - where would a rescued bear be released? Human-bear conflict, habitat encroachment and the risk of being trafficked remain constant threats and greatly complicate any possibility of release. Only once has Animals Asia been able to release a rescued bear back to the wild. One-year-old cub Rainbow was found caught in a hunter’s snare in a protected forest in Peng Zhou, China. After discussions with experts from around the world it was decided that the particular circumstances of her case meant Rainbow, even with an amputated paw, would have a good chance of survival after release. She hadn’t become inured to human contact, she was being returned to her original habitat, she had existing survival skills and the chance of being reunited with her mother. All positives which former bile farm bears and those who have been trafficked don’t have. It can take months if not years for rescued bears to be brought back to life at our sanctuaries in Vietnam and China, where we create an environment as close to their natural habitat as possible and encourage them to exhibit their natural behaviour. 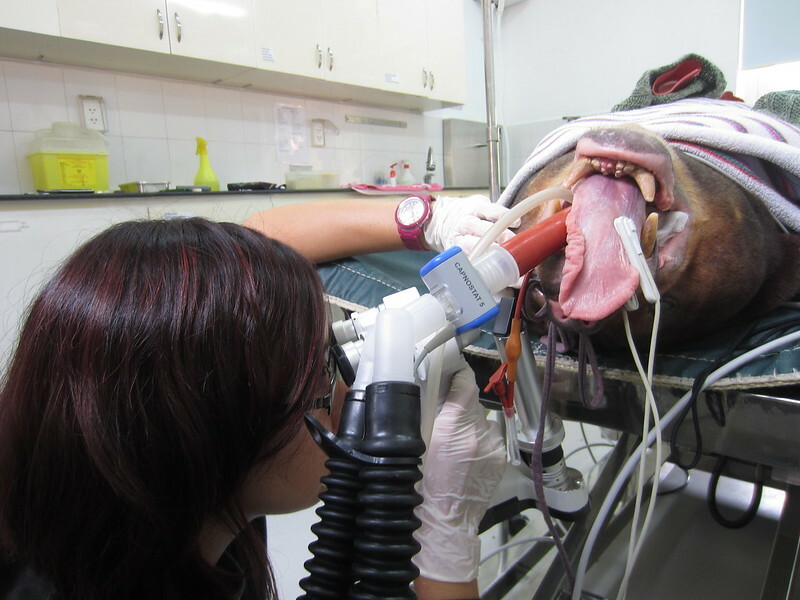 The first step is treating all the physical ailments caused by bile farming - such as broken teeth from bears trying to chew their way to freedom; damaged gall bladders from repeated bile extraction; cataracts due to poor diet, dehydration and chronics stress; and arthritis from years of being immobile. We begin to revive our bears’ foraging instincts by hiding “enrichment food” such as yoghurt, jam and honey around their large semi-wild enclosures where they can also search for termites, ants and earthworms. In the wild, their diet would change with the seasons so we try to replicate this by offering fruit in the summer and chestnuts in winter. 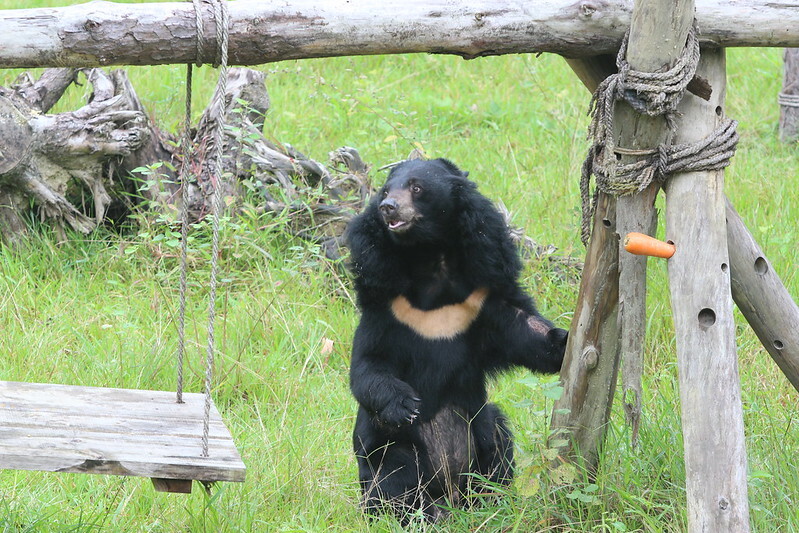 The enclosures have trees and bamboo frames for climbing, leaves and hay to build nests for sleeping, and pools for splashing around in - all of this is designed to keep bears active and stimulated. It allows them to rebuild their muscles and regain important skills. Many of the farmed bears have spent all their lives in isolation or they share the same space as other farmed, caged bears but are unable to interact with them. So we gradually introduce individual bears to bigger bear groups but are careful to avoid food competition that can lead to aggression. This painstaking care is life-changing for the bears, and there is always a cheer when we see a bear who had been too frightened to go outside venturing into the enclosure for the first time, or a bear who was once emaciated rebuild enough strength to clamber up a tree. But with almost 20 years of experience in rescuing bile farm bears, we know bears who have been caged, mutilated, kept immobile and fed an inappropriate diet or given inappropriate drugs for years and years, simply are not equipped to be returned to the wild. The very best we can do is to protect them from further danger and stress and allow them to live out the rest of their lives in the safe, healthy environment of the sanctuary where every consideration is given to their physical and psychological needs.